Have you ever wished that the whimsical destinations dreamed up by Dr. Seuss were real, and you could visit them yourself? At Joshua Tree National Park, you kind of can. There are several different ways to tackle Joshua Tree, and we debated the merits of many. We settled on entering through the West Entrance Station after a stop at the Joshua Tree Visitor Center in the town of Joshua Tree, and exiting through the North Entrance Station in the town of Twentynine Palms (a third entrance to the south at Cottonwood is another option.) While pets are allowed within the park, they aren’t allowed on any of the trails — plus, it was hot as heck and so we decided to leave our own pup poolside. With my parks pass we sailed in for free, though the usual entry fee is $20 per ride. With little cell coverage and even less water available within the park, a little pre-planning is necessary. We paused to take the only photos I got of all four of us throughout our time in Cali — long live the sparsely and discreetly used GoPro selfie stick! It was an intensely hot day and we’d been out and about for hours, so the crew was starting to fade as we swung up towards the northern entrance to the park. 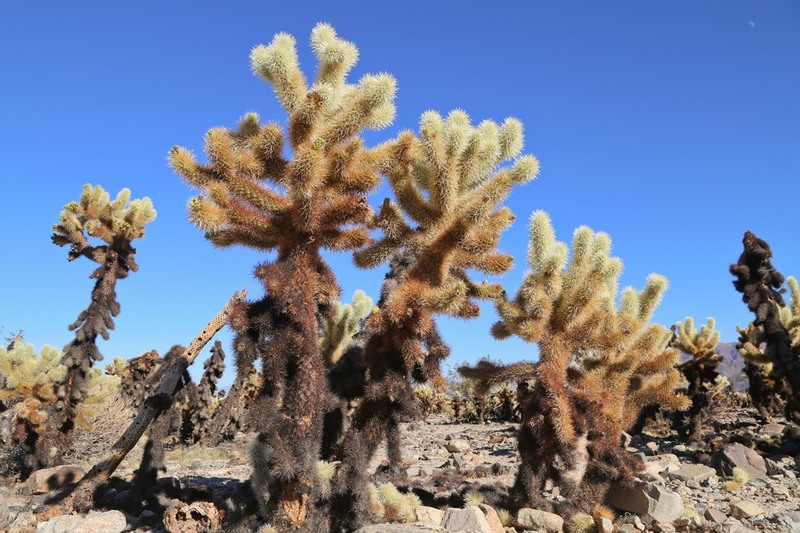 But I begged for one final small detour to the Cholla Cactus Garden, which my friend Zoe had raved was the best part of her trip.